Oh how I love, love, love football season! Ok admittedly, I may not be the most “die hard” fan of the actual game itself (I blame that on the fact that I never had any brothers)… but the fun and festivity surrounding it? You. Bet. As far as dressing for the occasion, it’s pretty common for students of Texas schools to rep school colors! That can be pretty tricky when yours is burnt orange… Don’t get me wrong. I adore the color, it’s just a little tricky to find. It really hasn’t been until the last couple of years that it’s started popping up here and there! (In actual cute clothing, ya feel?) 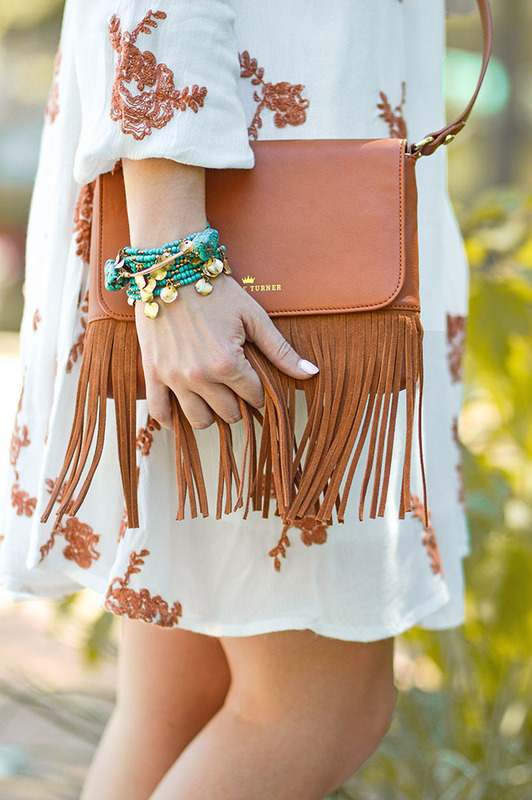 Hence my freakout over this dress, and even more so, this amaaazing Elaine Turner crossbody! Honestly what’s not to love? I’m trying to think of a single thing and am coming up short. The size is perfect for all of the essentials – wallet, phone, a snack or two, etc. The fringe? No other explanation needed. And the color?! A gorgeous tan that fits perfectly into the burnt orange category! But the best part? It also wears as a lovely cognac shade, so it works just as well with an every-day outfit if you’re not feeling school spirit quite as much. 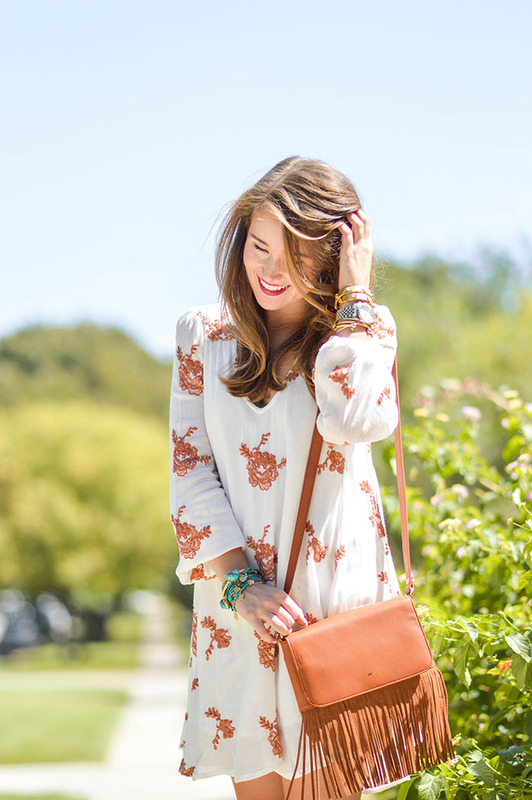 I’ve been wearing mine non-stop… favorite fall bag for sure! Best news ever? Use the code LONESTAR20 at Elaine Turner for 20% your purchase until October 7th! P.S. Y’ALL. There is an AMAZING event going on at Tory Burch! Get 20%, 25% or 30% off (depending on how much you spend) site-wide with the code FALLEVENT. I’ve been needing a black bag, and just pulled the trigger on this beaut. Giddy! You’ll also find my swoon-worthy riding boots included. Go, go, go! Thank you, Elaine Turner, for sponsoring this post! Okay I’m OBSESSED with this dress! You’re adorable! This is such a great dress! I love flowy dresses. I posted one the other day, too. I love the whole outfit!!! I went to Texas State and even though we weren’t very good at football we still loved to dress up to tailgate! This outfit is PERFECTION. And I’m not even from Texas… But oh so in love with it! I love your dress, looks adorable with the cowboy boots! Dressing up for game day is the best especially when you go to UGA. I pretty much wear black and white with red statement pieces (like a purse and jewelry)! I bet you miss game days! Love the blog! Love your blog Kate! Can I ask what camera you use? Your pictures are amazing! I’m so in love with this post Kate! I adore your cowgirl boots!!! And those bracelets are so cute and add a fun pop to your look! I love your dress I wish it game in gator colors! Cowgirl princess. My goodness, Kate… you’re beautiful! I love this dress and those cowboy boots. Your smile and hairstyle are beautiful. It’s sad the 2015 Texas Longhorns aren’t having a great season of football, but you certainly score a stylish touchdown with this fabulous outfit.